I had a decent amount of people stopping by the USTREAM chat tonight. 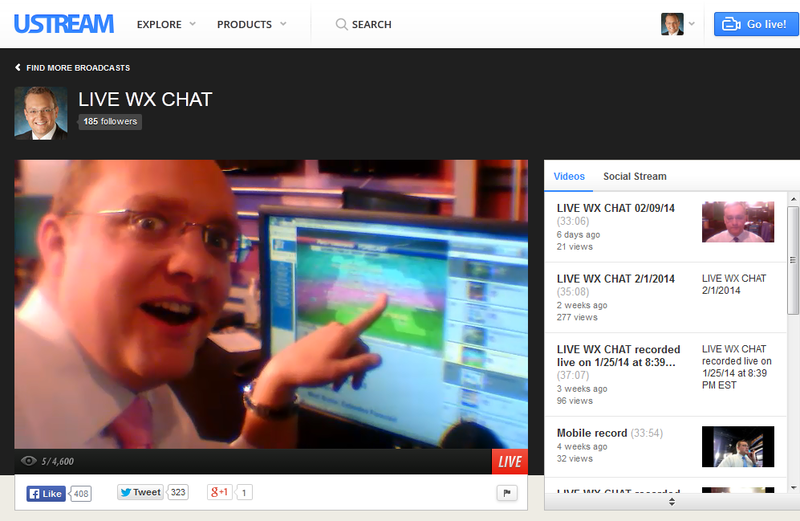 Here is a link to the channel to see the videos: http://www.ustream.tv/channel/live-wx-chat. A lot of questions were about the wintry mix for Monday. I will be streaming from behind the scenes for the 10 and 11PM news tonight. 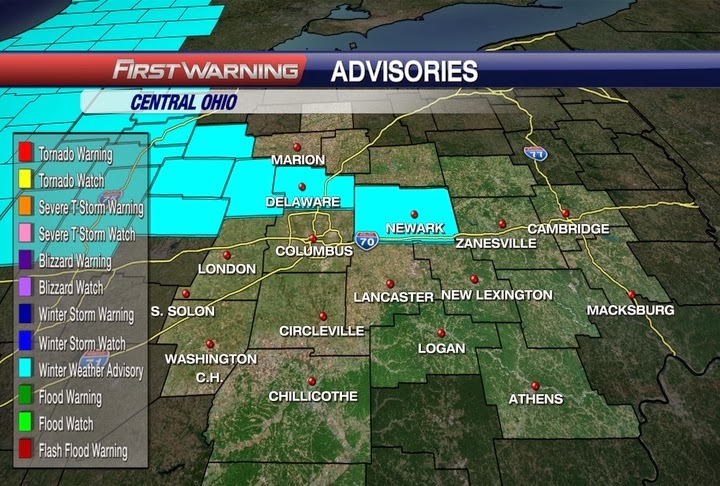 There is a Winter Weather Advisory issued for the counties just north of Columbus. These locations will likely stay all snow. The morning Monday will be dry and the same for the early afternoon. 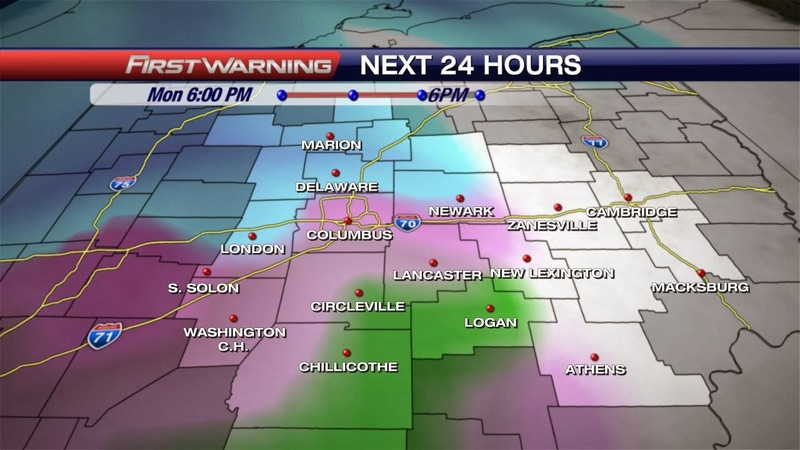 But around 4-6PM the wintry mix will move into Central Ohio. Above is the Futurecast model for 6PM tomorrow. If you live north of Columbus you have a much better chance of staying all snow and the locations that stay all snow will see the highest snowfall. For areas along I-70 and to the south it will be a degree or two warmer and that will result in sleet, a rain/snow mix, and rain even further south. It will be a very quick system. The above image does a good job of showing where we expect to see the rain(green), wintry mix(Pink) and all snow(blue). Most of the accumulating snow will be done before midnight Monday night, so it will give road crews time overnight to get to the snow north of Columbus. There will be some light snow showers or flurries overnight, but not a whole lot. Areas that see mainly rain could see a light dusting overnight. 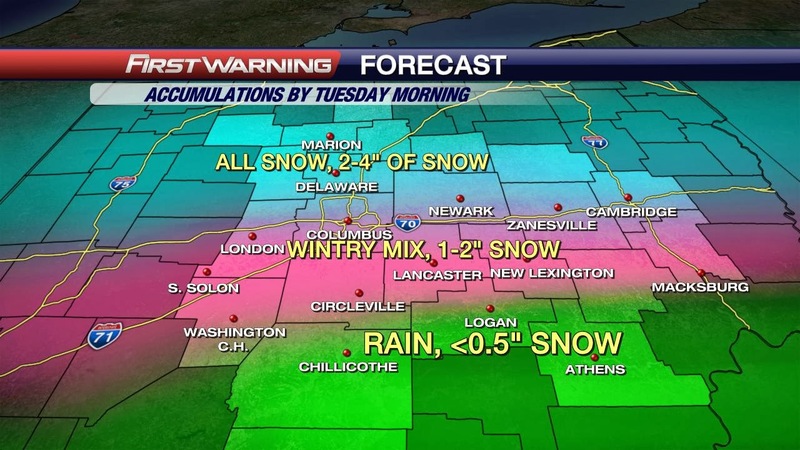 For the wintry mix, the closer you are to all rain the lower the snowfall expected. For areas that only see a little bit of a wintry mix and see a decent amount of snow, you will see around 1-2" of snow and if you stay all snow then 2-4" of snow can be expected. The good news is that once that system kicks out of here we begin a warming trend. I am going with 58 for the high on Thursday with rain showers as well. I think people will not mind the rain to clear some of the salt, snow, and grime away. I know I will be organizing my garage and installing some shelving units on my days off. I can't wait for the warmer temperatures because I haven't been able to do much in the garage all winter and I have two mopeds I need to rebuild and sell. Well I will check back in soon... Have a good one!